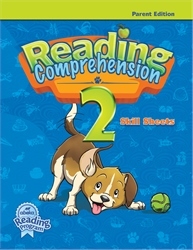 Assist your 2nd grader at home as he practices to improve his reading comprehension skills through the exercises found in Reading Comprehension 2 Skill Sheets (sold separately). This Parent Edition will help you introduce the selections, give vocabulary enrichments, answer comprehension questions, and relate the stories to appropriate Bible applications. This book also provides additional higher-level questions and learning activities such as chart reading, contrast information, sequencing, character webs, order of events, and much more. Be even more proficient in teaching the second grade reading course with the help of this book!